The following is taken from the Gaston Gazette in North Carolina. I find perspectives such as this darkly funny. They display a complete lack of understanding of the system and its funding. Of course, the statements about IOUs are completely false. The fact is the Trust holding US Treasury Bonds has absolutely nothing to do with the fiscal state of the program. Without those funds earning interest, full benefits could not be paid today. But what is even more amazing is his math and apparently the lack of an editor to check it. The fact is that given the assumptions he presents the accumulated money would be at most one quarter of the amount he expects and using the 4% withdrawal rule would provide a little more than $12,000 a year. No wonder politicians are reluctant to explain the truth. No, the statements about IOU’s are NOT completely false. 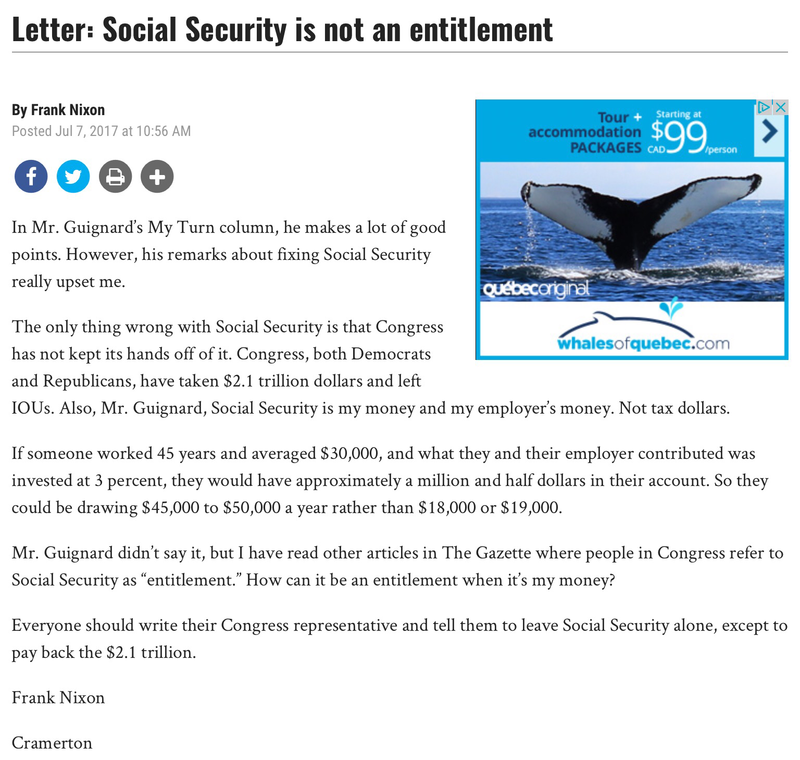 What we have in the trust funds are financial instruments that reflect Congress’ supposed willingness to tax future taxpayers (ostensibly general revenue taxation) to pay Social Security benefits. Sounds good. But, once you lay it alongside the $200+ Trillion of long term unfunded promises, our current nominal debt of $20 Trillion, plus our annual (as far as the eye can see) $500+ Billion deficit (growing to $1T in foreseeable future), those promises don’t look all that secure. Where there is fallacy in this individual’s argument is that he thinks Congress has some sort of a “rainy day fund” to source $2.1 Trillion of other people’s money to “pay back”. Where does he think Congress is going to get it – the French? Perhaps he believes Congress/President Trump can add it to the bill they plan to send Mexico for money to build the wall. No doubt you would have to look at all federal debt that way, including individual savings bonds. The point is nobody stole the SS money as many people believe and even if it was all sitting in some bank vault in cash, it would still be used up by 2035; sooner without the interest.